Situated off the ever bustling Cooper Square, The Standard, East Village is set in one of the most lively and artistic neighbourhoods in New York. A boutique hotel that combines cosy and comfortable with light and spacious, this really is the perfect place to stay whatever the occasion. With its own café and an American Nouveau restaurant (co-owned by Michelin-starred Chef John Fraser) it’s hard to leave once you’ve arrived. One of the main attractions here is the view. 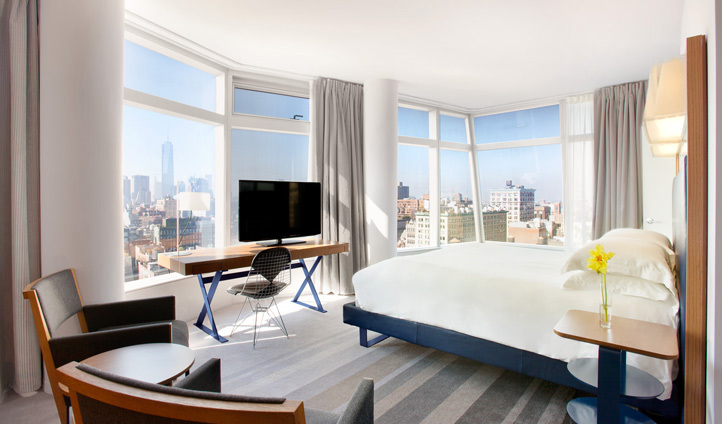 All of the 144 rooms offer spectacular, expansive and uninterrupted views of New York City. We particularly love the view from the Penthouse, situated on the 21st floor of the building, making it a special venue for amazing events for guests to enjoy including Annie O’s music series which showcases musical acts from across the globe. The Standard, East Village is perched just off Cooper Square, in the heart of one of the most popular and eccentric neighbourhoods in Manhattan. Spend your day drifting between a mix of locally-owned shops, and buzzing bars and restaurants, that this busy and lively area has to offer. The Underground line at Astor Place Station is only a 4 minute walk from the hotel, allowing easy access to the many sites Manhattan has to offer, including the Metropolitan Museum of Art which is just a 30 minute underground journey away. JFK, Newark and La Guardia airport are all within an hour’s drive from the hotel. From a Standard Queen room to a Downtown Studio, all 145 rooms are clean, spacious and fully equipped with all of the custom bathroom amenities. The contemporary, minimalist design gives an open feel whilst remaining cosy and comfortable. Large windows in every room (most are floor-to-ceiling and wall-to-wall), make for light and airy spaces with impressive panoramic views of the dramatic city skyline. Super comfortable beds with soft Italian sheets ensure for a good night’s sleep after a late night drinking in the Hotel’s Café Standard a few floors below. Looking for somewhere to eat or drink? We love the Café Standard, a relaxed and colourful street-side café located on the ground floor of the hotel. From serving casual American food throughout the day to signature cocktails late into the night, this is a fun and comfortable place to wind down whatever the time of day. 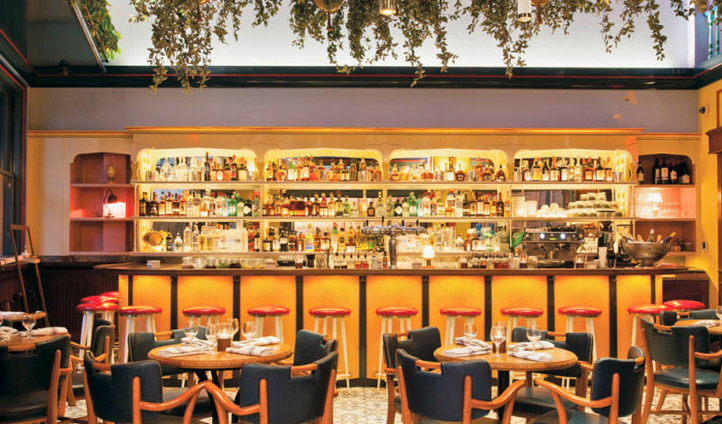 For something a bit more special, the restaurant Narcissa, run by the super hotelier Andre Balazs and Michelin-starred Chef John Fraser, offers an outstanding, complex menu featuring local and organic ingredients from Balazs’ Hudson Valley farm. Whilst we’d never encourage it, you really wouldn’t have to leave this amazing hotel to feel right at the heart of East Village NYC.